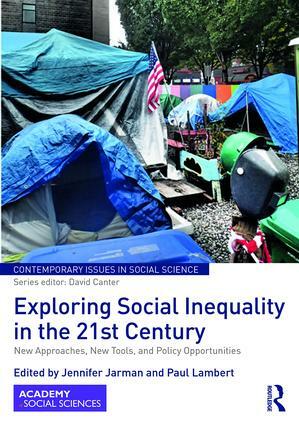 In a world where the effects of inequality occupy an increasingly prominent place on the public agenda, this book provides up-to-date and thorough analysis from the perspective of a group of researchers at the forefront of social stratification analysis. Exploring Social Inequality in the 21st Century is a clear and critical overview of current debates about social inequality. It includes new information, tools, and approaches to conceptualising and measuring social stratification and social class, as well as informative case studies. Throughout, the researchers describe the direct and indirect costs of social inequality. Divided into two parts – Conceptualising and Measuring Inequality; and Costs and Consequences of Inequality in the areas of Education, Employment, and Global Wealth – it includes new findings about the growth of wealth inequality in the G20 countries, and a detailed examination of tax policies designed to reduce inequality without affecting economic growth. With substantial contributions to the analysis of inequalities in education, and explanations of the processes and consequences of social and gender-based exclusion, this book is essential reading for anyone interested in understanding contemporary social inequality. This book was originally published as a special issue of the journal Contemporary Social Science. Jennifer Jarman is an Associate Professor of Sociology at Lakehead University, Canada. Her research focuses on changes shaping contemporary labour forces and their consequences for equality. Paul Lambert is a Professor of Sociology at the University of Stirling, UK. His research focuses on methodological debates in the analysis of social stratification using statistical techniques.